Some older posts from this blog will be gradually moved over to the new site, with a bit of a tidy up and maybe even some new photos. Eventually this blog will just be about my personal running journey and all the coaching, nutrition, outdoors and massage tips and information will be on the new blog. Hope to see you over at the new blog! I've written a few articles recently about nutrition for sport and runners. To make life easier I thought I'd put all the links in one place! If you want any more information or support you can check out my nutrition services here! I recently started my Lowland Leader qualification with a two day training course at the Plas Y Brenin outdoors centre in Wales. 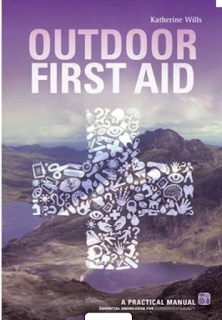 Whilst I was there I also completed a First Aid at Work in an Outdoor Environment certificate. The first aid course was brilliant! Lots of time (over half the course hours) spent outside practicing with real world examples in outdoors situations. It's all very well doing CPR and knowing the recovery position when you are on the flat and an ambulance is 10 minutes away. But what happens when you are up a mountain, on rocky, uneven or steep terrain, or when you know mountain or Lowland rescue will be hours away from you? It changes the way you prioritise and plan what you do and the decisions you make, so it was great to have a framework to do this with. It was also great to meet all the interesting and experienced outdoors people on the course, including international mountain leaders. It also gave me some great additional items to add to my first aid kit when I am travelling further afield, a group shelter for example. Also lots of ideas on the right things to pack into a small first aid kit that contains items with multiple uses and makes use of other kit, walking poles as splints for example. 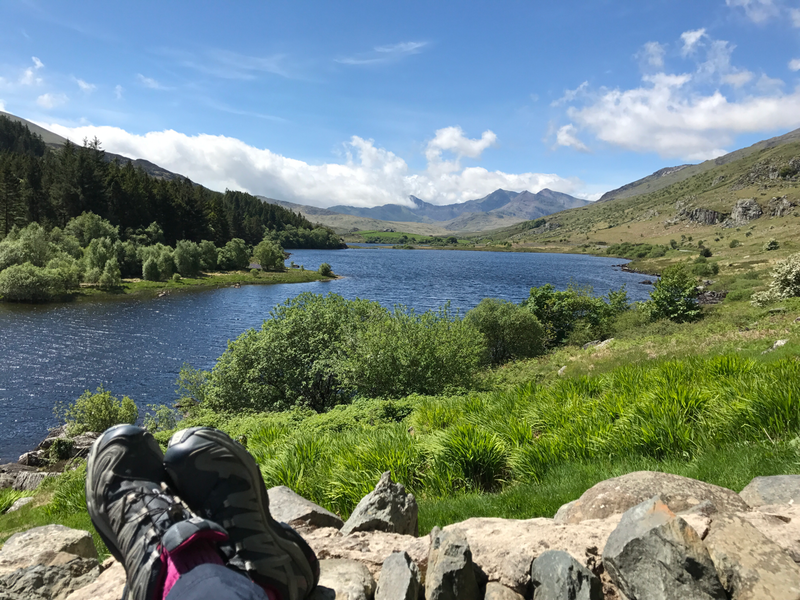 Plas Y Brenin is a great location for outdoors courses of all types. The bar has what must be the best view in Wales and there are always loads of interesting people around to chat to. I was camping along the valley a little, with magnificent views from my tent. But I'd be tempted by their board option if I came again, food looked good! I was then luck enough to have two days free in brilliant weather to go walking. 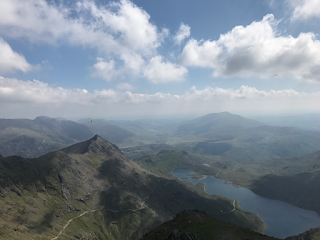 I finally (3rd time lucky) summoned snowdon and had a days walking in the woods about Nant Peris. The Lowland Leader course was again mostly outdoors. With 5 hours of walking on each of the two days. The aim was to consolidate the practice walks you had already logged on your own and focus learning and experience on all aspects needed to be a good walk Leader. Lowland terrain is non-technical, not to steep, on marked public rights or ways and not more than 3K from a point where you could be rescued, like a road. 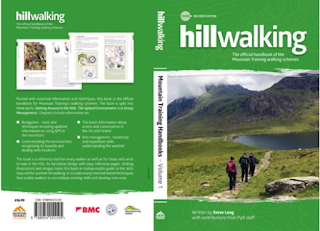 My aims for the course are to lead walks, overnight expeditions, navigation introductions and guided nature walks for runners and walkers to get people out on the trails of the Home Counties; ideal Lowland terrain! The course taught you all the elements needed to practice for the assessment; planning, navigating, kit, fitness, leadership skills, etc. Again the tutor and course was great and I'm fired up to get my practice walks sorted and hopefully do the assessment this year! Running my own sports business, 2 months in! I’m now two months down the road of my journey into a new career, so it feels like a good time to reflect on the highs, lows and what I’ve learnt. Most importantly my new job is incredibly rewarding! I’ve worked as a running coach and massage therapist for a wide range of people over the past few months, and everyone has been unique and fascinating. From writing plans for runners aiming for the Ultra Trail Do Mont Blanc, an epic 100 mile race around Mont Blanc, through to supporting people right at the start of their running journey; everyone has their own goals, challenges and successes to celebrate. I’m really enjoying talking to people, getting to know them and working out how I can best help them. Being flexible with my coaching and my massage treatments to best meet their needs and explaining why I am approaching things the way I am seems to be working well. I’ve had some really rewarding sessions in the massage treatment room too; helping students ease out their shoulders, back and neck during exams, treating neck and shoulder tension in office workers, easing out aching muscles in runners, rock climbers, hockey players, tennis players, all sorts! It’s been a brilliantly varied couple of months. As I suspected I’m not finding the marketing and sales side of things as easy to do. Last week I went to a conference, and tried my hardest to network whilst I was there. I also attended a local business networking and referral group - which if I’m completely honest was one of the most stressful and nerve wracking experiences of my life. Even though I can really see how it can work, it took me the rest of the day to calm back down! So, I’ve started to approach things in a different way. I know from my career in IT that I’m much better and more natural at forging long term, meaningful, business relationships one to one. So that’s what I’ve been focussing on. I’ve been pounding the pavements of my local high street talking to all the businesses, leaving flyers, seeing how their businesses are going, how I can spread the word about them and how they can spread the word about me. I’ve already had some really interesting ideas and opportunities to work together come up. I’m getting better at social media, having written myself a plan (you can take the woman out of Project Management etc…!). With a structured approach to Social Media engagement, with the right communities, with good content and timely posts I’m making good progress there. I’m also learning to spot and keep in touch with personal contacts in the industry, it pays to be curious about what others do and what makes them tick. On the 29th April (2017) I went to the first Female Coaching conference, organised by the Female Coaching Network and Project 500. I've followed the Female Coaching Network for some time, and like the knowledge sharing they do across sports and countries. They often have useful articles and profiles, as well as a great social media presence for networking. The Conference itself was at Surrey Sports Park in Guildford, which was handy for me but many other attendees had travelled much further. The location was excellent and had great facilities. I'm not great at formal "networking" but there were plenty of opportunities to get to know the people sat near you, at the tea and coffee area and over lunch on smaller tables. We started the day with a talk from Karen Brown, who coached the Women's Hockey team to Olympic gold. She had lots of proactive and useful advice on how to plan training, make things engaging, how to practice the key skills and demonstrated her passion and dedication by the hours of opposition footage she watched to plan the best tactics. The importance of letting the team define how they wanted to work, what the team atmosphere should be etc and not breaking from that no matter how important the game was important an fascinating. It got me thinking about what team and psychology aspects there are in running, it's not the same as a team sport but there is a lot to learn. We had great seminars, the first on how to improve speed of an athlete with sprint training. Lots I already knew, but great to recap sprint mechanics and just how much it can help runners and anyone with elements of running in their sport. The second seminar I attended was about mobility assessment and improvement for athletes, a great practical session with tests and exercises practiced in small groups which worked very well. Something that will be useful for both my coaching and massage clients! "Feel the fear; do it anyway"
It's been a while since I've written a race report; and I'm pleased to report that on the 9th April I completed a marathon! The Pewsey Downsaround is run by the Wiltshire branch of the Long Distance Walkers Association (LDWA). You can run or walk their events, in the past I've run them, but this one I walked. They offer a range of different distances from 10 to 35 miles, I opted for the 26.6 mile event. As with all LDWA events they involve navigation, you need a map and compass and they provide printed directions a few days before the event. These directions rely on a little prior knowledge like knowing how to walk on a compass bearing, knowing to spot the different signs for footpaths and bridleways, knowing the different between and stile and a kissing gate! I find it a great way to track your progress through the event though, as you get to the end of a page of directions and can put it in your rubbish pocket. The walkers on the longer events set off at 8am. The organisation was absolutely brilliant, with parking, pre event toilets and registration all sorted. There was also a kitchen in the scout hut serving tea and coffee before we set off. The only piece of mandatory kit beyond map and compass was a mug, to reduce rubbish on the course and plastic use, so mine started the day filled with tea. The weather for the day was wonderfully sunny. so much so that the factor 50 and a sun hat was needed. I went for long sleeved top and trousers as I prefer to be covered up with clothes over being sticky and dusty with sun screen. The day started fresh and cool, but by early afternoon it was pretty hot! The route was wonderful, with the only steep hill towards the start of the route and from then it was rolling downland, taking in chalk ridges, crossing the Ridgeway, and finishing along the Kennet and Avon canal and the River Avon. In terms of pacing I started fairly slowly, at around my usual walking pace of 3 miles an hour slowing up the hills. I fell into a walk with a older man called Stephen who happened to be an expert in local archaeology so I had a fascinating 6-7 miles taking in the various features from various era, from longbarrows to chalk horses. There were three checkpoints along the 26.6 mile route, all stocked with sweet and savoury snack and a fab cake selection. Also lots of squash and water which was much needed. I never really stopped for long at them as I know I seize up, so I topped up my water and headed out. I brought my own sandwiches with me as I prefer savoury food on events like this. For this walk I went with a walking, not running, rucksak from Osprey with a suspended back for less sweatiness! It works with a 1.5 litre camelbak bladder. I worn Salomon GTX walking shoes, with two pairs of thin socks, instead of boots and had no issues with blisters. My walking boots would have been too uncomfortably hot for the weather on the day. Light Berghaus walking trousers and a light long sleeved collared top from Rohan finished off the kit. I carried first aid kit and an extra layer as well as my food, keys and phone in my bag. After around the 15 mile mark I decided my legs and feet felt really good so I sped up a bit. I have a couple of natural speed when walking and this was my faster pace. The latter half of the course was generally flatter so I felt like I was speeding along despite the heat. Luckily there were some beautiful wooded sections and a little shade. The last two miles wound their way back into Pewsey along the river and through a nature reserve. I had got a real stride going and whilst I was starting to feel like my legs were getting tired I could keep pushing on. 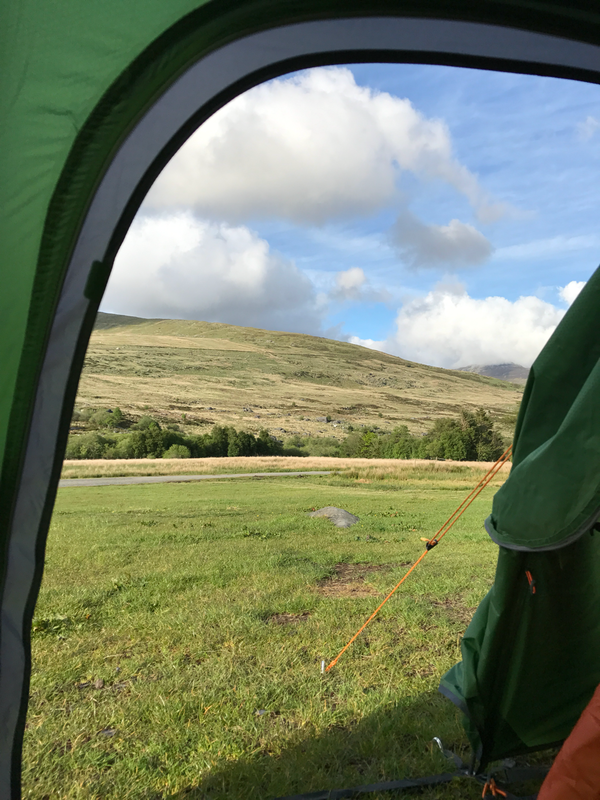 I began to see other walkers who had finished who were cheerily encouraging me on, and then up a last hill and I arrived in the scout hut, 8 hours 11 minutes after I started there. There was an immediate print out of your results, and wonderful volunteers offering you tea and a hot meal. All of this for £9 entry! This week I made a big change, I changed careers. Not only changing job role, but the industry, routine and ways or working are all new! I’ve moved from 14 years of being a Delivery/Project Manager in IT to being a full time Running Coach and Sports & Remedial Massage Therapist. It’s really exciting and also slightly nerve wracking. For the first time in my life I’m self employed and there is only me in the team. I’m used to working in multi disciplinary teams with highly skilled people around me, luckily I’ve learnt lots from them as I now have to do everything myself. The actual work of coaching and massage therapy I love, but around that goes the finances, planning, marketing, sales, pricing, writing and networking some of which I’m better at than others. I’m having find ways to make sure I work on the things I don’t enjoy as much but are equally as important. I now manage my own time; no more 9-5! Most of my clients are free evenings and weekends, so managing that balance of demand vs not letting the new work take over my life completely will be a challenge. As a start I’ve set myself office hours for each day, and will switch off my work phone outside those times. The biggest challenge is going from feeling very experienced and expert in my job to being relatively new, definitely starting towards the beginning of the experience, network and expert knowledge ladder. It’s very exciting and means I spend lots of time researching, studying and discussion things with others I know in the industry. The question I’m being asked most often at the moment is why have I made the change. It started when I worked at Telefonica and set up a lunchtime running group, I found it incredibly rewarding and motivating. From there I’ve gone on to coach at my local running club, and then 18 months ago started doing paid, private coaching. I absolutely love it, and there are many similar skills to Delivery/Project Management; motivating people, planning to help them reach their goals and working out what gets the best out of them. The Sports and Remedial Massage links back to a fascination I have with how the human body works (I nearly did medicine as a degree) and a desire to help people with their health, wellbeing and fitness. Whatever happens it will be an exciting and rewarding journey!